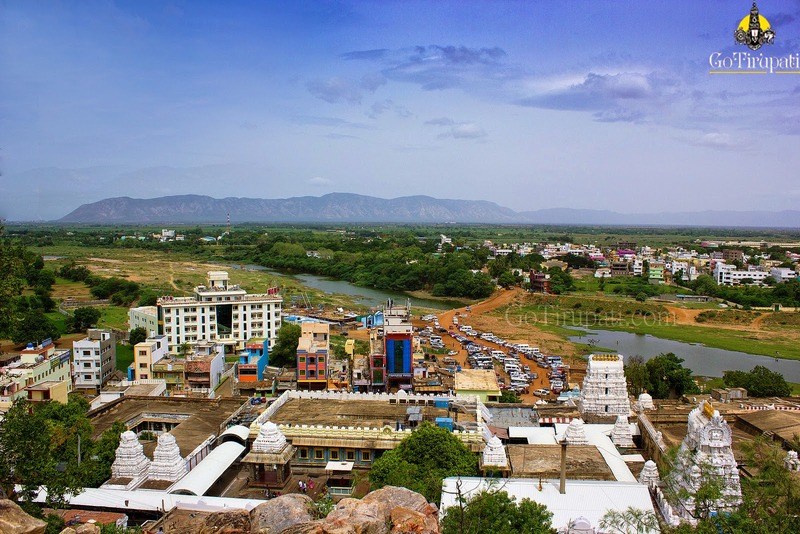 Sri Kalahasti Derived its name from, the Spider(Sri), the Serpent(Kala) and the Elephant(Hasti). Appeased with their Unflinching devotion, Lord Shiva gave them a boon that their names be merged with the VayuLinga and called as Sri KalaHasti. Parvathi gained Shiva Gnanam and came to be known as Gnana Prasunamba. Abhishekam is performed in the Morning: 7:30 am, 9:30 am, 10: 30am; Evening: 5:30 pm everyday. We want to perform "kala sarpa dosha nivarana Puja" for my d-in-law. Son & d-in-law in Delhi...we are in bangalore. They dont get time to come as Parliment sesssion is on...Can we two do Puja with their horoscopes...Will it be effective..we are BP patients..can we take light bkfast b4 puja..We pal puja on tue / thu...4/8 or 6/8..will reach by cab..
Can booking be made on line..or shd we come prev. day & stay at hotel..
pl. clarify our doubts..we need to perform puja b4 9/8.. Anyone can perform pooja, but the best results will be seen only when the actual person performs pooja activity. One should go on fast till pooja completion. Please take liquid foods. Booking is not available online, tickets will be issued at counter to pilgrims. Yes, after performing pooja, please discard clothes which you are wearing at the time of pooja. Please leave your comment at http://gotirupati.com as it would be easy for me track. My DOB is June 20 1981 and I want to perform rahu kethu pooja . Could u please suggest me the timings on which day should i perform pooja according to my date of birth. Please drop an e-mail to gotirupathi@gmail.com with Date of birth, time of birth and place of birth. Please perform Pooja on Tuesday between 3 p m - 4:30 pm. 2) Next day morning after taking bath, reach Temple and do Abhishekam with Milk to the Idols at Rudra Padam ( which is 100 ft from Pathala Ganapathi Temple) and do 3 Pradakshinam to the Idols. 5) Now you are good to leave home. One should fast till they complete pooja. My DOB is May 7 1990 and I want to perform rahu kethu pooja . Could u please suggest me the timings on which day should i perform pooja according to my date of birth. Please perform pooja on Tue between 3 pm - 4:30 pm. Do leave comment at http://gotirupati.com so that it will be easily for me to communicate. No, it should be done before pooja only. Not after pooja. After Rahu Ketu Pooja you are not supposed to visit any other temples / Not to visit any relatives homes/ not to perform any poojas. I want to perform rahu ketu pooja could i give hairs at srikalasthi. When should I able to give hairs kalyana Kata on same day on or before pooja. You can offer hair before Rahu Ketu pooja . but not after Rahu Ketu pooja. After Rahu Ketu Pooja you are not supposed to visit any other temples / Not to visit any relatives homes/ not to perform any poojas. Please perform pooja on Tue , between 3 p m - 4:30 . You need to fast till you complete pooja. after performing pooja, some told discard clothes which we are wearing at the time of pooja... is it true??? discarding the sense, it should be thrown or we should give to poor people? Not required , no need to discard clothes. you can take bath after completing pooja at hotel room. Please donate meal packets 2-3 after pooja. Do leave your comments at http://gotirupati.com so that it would be easy for me to reply in time. My astrologer has suggested to do Rahu-Ketu puja for me (Unmarried), my brother (married) & Brother-in-law. Please let me know below issues. - whether three of us can do puja by single ticket of 1500 / 2500 ticket or separate tickets. What is the difference between these two tickets. - Are their wifes & children need to attend puja compulsory as one child is below one year of age. - whether different puja is there for rahu-ketu dosha & Kaal sarpa Dosha. As each of you needs to purchase Pooja ticket at counter. Only one person or couple can perform pooja on a single ticket. You and your brother-in-law can opt for Rs.300 ticekt and your brother can go for Rs.750 ticket, where he can perform pooja along with his wife or he can perform pooja alone. In Rs.750 ticket, his wife and child can accompany him during pooja, if they don't want to perform pooja. Please leave your comment at http://gotirupati.com so that it would be easy for me to reply. I was trying to know the difference between 1500 & 2500 ticket. Apart from rahu-ketu puja in a mandap nearby main temple, what extra we wil get. Whether there will be person to guide the puja more personally. Does the Abhishekam includes in this or we need to buy extra ticket for the abhishekam. & Please let me know, whether puja for rahu-ketu dosha & kalsharpa dosha will be same. Yes, for Rs.2500 it will be more attention during pooja, they will explain clearly on the pooja process. No , Abhishekam is different, it is not part of Rahu ketu Pooja. You need to buy Abhishekam tickets separately. It is called Rahu Ketu Kala Sarpa Dosha Pooja, which is one and the same. Please leave your comments at http://gotirupati.com , so that I can reply in time. Hi planning to have rahu ketu pooja after pooja can i donate in tirupati and darshan also. Hi planning to have rahu ketu pooja after pooja can i donate hair in tirupati and offer darshan. No, you should this other way, Donate hair at Tirupati and complete Darshan. Then plan for Rahu Ketu Pooja at Sri Kalahasthi. Please leave your comments at http://gotirupati.com so that I can reply in time. I already taken darshan ticket for afternoon session and in moarning i planned to have pooja, any alternate for this. let me check with srikalahasthi temple priest on this today. Upto what time temple will open in Kalahasti in evening. Rahu Ketu Pooja will be performed till 6 pm. 6 pm is the last pooja slot for Rahu ketu pooja. For Rs.300 , the accompanying person has to stand next to you. till you complete. So it is not advisable for mother and baby to stand for 40 mins. It would be nice if you opt for Rs.750 ticket so that they can sit next to you. Yes, you can visit Sri Kalahasthi Temple, if not performing Rahu Ketu pooja before Tirupati Darshan. You can perform pooja on Sunday at 9 am, please do rudrabhishekam as well which is at 10:30 am. Rahu Ketu pooja followed by Rudrabhishekam is more effective. No need to carry pooja material, Pooja material will be provided by the temple staff. Purchasing ticket is enough, rest all will be provided by the temple staff . Pooja material will be provided at the Temple counter itself. Please leave your comment at www.gotirupati.com so that it would be easy for me to reply. We want to do Pooja at Kalahasti for success in job. Is Rahu Kethu Pooja and Kala sarpa dosha pooja are the same?which one I should opt? Which are the better days to do that pooja? As you told after pooja it is good to do Rudrabhishekam.I want to do Trishati pooja also. Please let me know how to plan? I have 2 kids son 6 years and daughter 13 years. Do we need to take saperate ticket for kids? one of temple priest told take separate ticket for daughter. Me and my husband can do pooja one single ticket? Is this effective? please reply me. If pooja time is very late ex.4pm. Do we need to do fasting? My Kids and husband also should be in fasting for Pooja? Do we need to take ticket on my name or my husband name? I want to do pooja for my career growth. Yes, one should fast till they complete. Whoever performing should only do the fasting. You can have liquid foods. 1.Is Rahu Kethu pooja and Kal sarpa pooja are same? 2. I and my husband want to do pooja. If we take ticket on my husband is it effective for me also? or we both should take separate tickets? 3. My daughter is 13 yrs do we need to take separate ticket for her also. if we takcet on my husband name that will be effective for all family members? I want to perform rahu kethu puja on 3rd Sunday before after noon.do I need to be in fasting in my Family? Right now am in Tirupati ,on Sunday before 1pm I am plan to do for rahu kethu puja.is it fine or any time is required? Also pks let me know any fasting required? Yes, you can perform pooja at 1 pm. Yes, fasting is required. I am planning to perform rahu pooja on 10-01-2016 sunday. I am single person. What will be the time for batch for single individual person on sunday ? Perform pooja anytime between 4:30 pm - 6 pm. Be there at the ticket counter by 3:45 pm. Could you please let me know the procedure. Will it be possible for you to perform pooja on 17th jan between 4:30 pm - 6 pm. Usually normal pant shirt is also allowed. But traditional is preferred. Also, my brother would like to perform a puja on behalf of my father (DOB - 4 Nov 1946). Please suggest a relevant puja for my father too. Thanks. Sir my name is venkatesh .my dob is 03/09/1981 time 12.55 on .place : bangalore.I want to go kalahasti.I want to do polka. Old suggest me sir. from 9:46 PM on February 7, 2016 to 10:35 PM on February 8, 2016. 1. I am from Hyderabad. I want to do Pooja at Kalahasti for abroad oppurtunities.Do i need to do Rahu Kethu Pooja or Kalasarpha dosha pooja? 2.I am married. Should we take ticket on my name or my husband name? 3.do we need any other pooja after rahu kethu pooja for better effect? 4. Do we need to leave off clothes after pooja? 5. We are planning to do pooja on March 8th 2016. Which time is good for pooja. Kindly clarify my queries.So that i can book my trian tickets. Thanks in Advance..
2) It will be one ticket for husband and wife. 3) After Abhishekam, please purchase Rahu Ketu Pooja.Tickets which will be issued at the counter. 4) After pooja, please offer 2 -3 meal packets to the poor. 7) Now you are good to start Home. Rahu Ketu Kala Sarpa Dosha Nivarana Pooja with family or we can do pooja alone. It can be performed as a single or family. There is no harm in performing this pooja with family. Sir, my date of birth is 18.10.1981 9.33pm. Till I am not married. Can I perform rahu ketu pooja. Can I give hair at kalahasthi before pooja. Pls guide the procedures. Namaskaram sir, I am Janaki and my dob is 02/09/1991 ,6.50am in chennai. There has been suggestion for rahu ketu doosha pooja for me. kindly suggest me the date , day and timing to perform the pooja. can we do bookings for pooja online? Sir this is varalaxmi my date of birth is 02-12-1989.time of birth around 6.00PM to 6.30PM at pulivendula. My marriage is getting delay due to dosham .could you please check & suggest me which pooja is better for getting marriage soon. Sir,I wish to participate in raghu,kedu pooja next week.Should I make advance booking at the Devasthanam?.If so let me know the procedure,or for raghu kala pooja right time to attend seva ticket counter.Also let me know the revised rates for Ra&Ke pooja.Thank you sir.Venkatapathi. Hi sir. My dob is 05/10/1985 time 8:00 am. Born in siloguri west bengal. I have been suggested to perform the kaal sarp dosh puja. Can u suggest the best time and datedate me to perform the pooja? My DOB is 19/09/1990 and I want to perform rahu kethu pooja . Could u please suggest me the timings on which day should i perform pooja according to my date of birth. My DOB is 30/3/1990 and i want to do rahu kethu pooja for marriage.please suggest me day for pooja based on my birthday.